I sit in the middle of Snowpocalypse 2016…In Colorado, that is. We only got about fourteen inches. Which, from a Colorado perspective, isn’t all that much. Honestly. It’s a bit more than normal, but…it’s manageable. To my great surprise, the school district actually closed today. That hardly ever never ever happens. Our school district goes to school in all sorts of weather. Almost like the postal service. I read a post from a friend of a friend of the Superintendent where he said he didn’t like to close schools because of all the kids who get help with meals. Bless him. I can handle less snow days for that reason alone. Regardless, here I sit, taking a break from work, with kids and husband home. That’s not a normal Tuesday for me. I’m usually sitting alone, in the quiet, with the occasional nudge from one of the furry kiddos. They’re home, and it’s still snowing. The weather reports said that it was supposed to stop by now, but the almost sideways fine, sticky snow is still coming down. That’s all well and good. I don’t mind snow. We’ll have school tomorrow, and since I don’t have to go far, it won’t be too horrid. I have to backtrack a little on this one. Back to 2009, when my Dear Husband first went away on deployment. He was gone for almost nine months. Fall, winter, and a lot of spring. Yay me. Because Colorado gets snow eight months a year on average. So, guess who was stuck with the three car driveway, and the looooooong sidewalk out front? That’s right, the person who despises shoveling snow. Keep the comments about why I live in Colorado to yourself. So after yet another snow event that took hours out of my time, and my kids were smaller then, less able to be without direct supervision, I went to the Home Depot, and looked for a solution. It seems simple, yet it’s not. We have a three-car garage. We also have three cars, and all three park in the garage. There’s no real work space, or anywhere for us to park various lawn and outdoor tools. Dear Husband is good at creating storage, so he’s managed to fit the things he needs, but the lawn mowers (yes, we used to have four, don’t ask!) and any potential snow removal thing would have to live outside. I’m not putting a $400 snow blower outside. SO…impasse. I ended up with this beauty. $99 bucks, and it hangs on a hook. Well, it did. That brings us back to the current Snowpocalypse. Dear Husband waited for the wind to quit whistling past the house, and went out to begin the clearing process. He got almost all the way through it – was on the sidewalks – when our dear Toro, the electric snow shovel of light….DIED. It just stopped. Dear Husband is pretty handy, so he took a look at it. It’s not a complex machine. There seems to be nothing wrong with it. Yet there it sits, dead. Does it know? I haven’t been vocal until now, but I’ve finally negotiated with Dear Husband. I will be getting a snow blower. 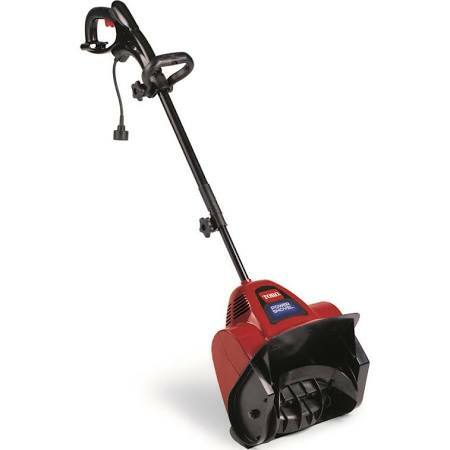 One that is independent of any cords, and big, and capable of clearing my never-ending walkways and driveway quickly and efficiently, with no backbreaking work for me slaving over a freezing shovel handle. The snow blower will get a place to live, a place to reside, and I’ll even let the lawn mower (we’re down to one, like normal people) come in out of the elements. Until recently, though, the Toro Broom was the only thing that stood between me and quality time on the heating pad. There was no snow blower in my future. So RIP, my dear Toro Broom. You’ve saved me – on the mornings when we had to go to school, on the one crazy morning when I had to get myself and both kids to a taekwondo tournament, when I was the last one to shovel one snowy day and risked a nasty-gram from the HOA, and in general when it chooses to snow the moment Dear Husband leaves. Just please…no more snow. I haven’t gotten the snow blower yet.